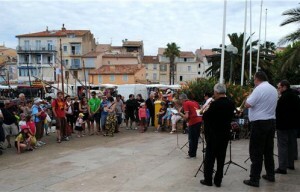 May 7, 2014 – This morning, while the public market was in full swing and no more place was available at the public parking on the port, 220 passengers from the ‘Star Pride’ disembarked on the port of Sanary which has become a favorite destination for cruise as the city was awarded “The Unexpected Pearl in the South of France” by the American magazine Cruise Insight. Thanks to the combined efforts of the staff of the City Hall, the Toulon Office of Tourism, businesses and service providers dedicated to the development of the cruise industry in the Var, the town of Sanary welcomes each year more and more cruise ships . There will be more than 20 cruise stop over this season! This success is due to the reputation of Sanary for its typical Provencal market, its pedestrian streets and sunshine, and its folklore – music, dances and gastronomy.